A recent news item on a doctoral dissertation written in Xhosa at Rhodes University by Hleze Kunju brings up the question: How many dissertations have been written in what African languages?1 This post won't provide a definitive answer, but will point to some information2 in the hopes of eliciting some responses and developing a more complete picture. First, Dr. Kunju's dissertation, entitled "IsiXhosa ulwimi lwabantu abangesosininzi eZimbabwe: ukuphila nokulondolozwa kwaso," is the first PhD thesis in Xhosa at Rhodes. It considers a Xhosa community in present day Zimbabwe that had responded to incentives given (but not followed through on) by Cecil Rhodes, The news article describes this work as "'a milestone' for Xhosa academic writing and a glimmer of hope in the quest for a decolonised and transformed education system in [South Africa]." The same article mentions that seven other doctoral students at Rhodes have done their writing in African languages, without giving more details. This story brought to mind one from last decade where Gatua wa Mbugwa wrote his PhD dissertation in plant science at the University of Wyoming in 2008 in both Gikuyu and Engish (abstract in English here). This was after doing the same with his master's thesis at Cornell University - writing in Gikuyu and translating into English. These were remarkable efforts, praised as an inspiring model by author Ngugi wa Thiong'o, who said that Dr. wa Mbugwa "almost single-handedly invented scientific Gikuyu language, thus proving that scientific research can be reported in an African Language without loss of scientific content and value." There are other examples. In South Africa again, for instance, Zinhle Nkosi wrote her 2011 dissertation at the University of KwaZulu-Natal in Zulu. It was about the teaching of Zulu at the primary school level, and the work on it "meant finding the right terms to describe research methodology and theories of language and learning." Dr. Nkosi subsequently supervised master's students writing their theses in Zulu. In Nigeria, there have apparently been doctoral dissertations written in Yoruba, going back to the first one at Obafemi Awolowo University, Department of African Languages and Literatures in 1990 (according to Prof. Lawrence Adewole on his Yoruba for Academic Purpose blog). Master's theses go back to 1981, As of 2015, there had been five PhD dissertations written in Yoruba at that institution. It is interesting that this was evidently the result of a deliberate departmental policy. I do not at this time know whether similar policies have been implemented at other institutions in Nigeria or dissertations written in other Nigerian languages. Prof. Adewole's survey of published works and dissertations in Yoruba3 would have more on what has been done in that language (I don't presently have access to the book). It has been suggested that there have been dissertations and theses written in Hausa at universities in northern Nigeria, but I have seen no references. In terms of time scale, a bibliography of doctoral dissertations in 1946-76 shows only English titles,4 so perhaps we are looking only at the period since 1976 for work in Nigerian languages? I have no information on the first PhD dissertation in Swahili, though that may go back a number of years. Nor did I find any figures on the numbers of theses written in this language, but it must be significant. Ethiopia, one of the two countries on the continent never to be colonized and one of the few to have an indigenous language in an official role - Amharic - is a case where one might expect to see doctoral theses in that language. Indeed there are evidently a few PhD dissertations in Amharic, but apparently a fair number of master's theses. See for example a list of theses in Amharic Language, Literature, and Folklore at Addis Ababa University. Some dissertations have gone beyond language itself, such as one entitled "ባህልና ልማት በበርታ ብሔረሰብ" ("Culture and Development in the Berta Ethnic Group"). It may be that no Francophone university in West Africa has any examples of doctoral dissertations written in an African language. I had thought that maybe Guinea during the Sékou Touré years might have some examples, but apparently universities there did not offer doctoral degrees and master's theses were in French. One apparent innovation in Guinea at the time was that theses had abstracts in one or another national language - something that might be considered at universities elsewhere on the continent today. That leaves many languages and countries on the continent unaccounted for, so hopefully I can return to this topic with more complete information. The typical pattern, such as emerges from the very limited survey above, is for dissertations and theses in African languages to be accepted only in departments of African languages and literature, and for there to be some production of master’s theses in an African language before any dissertation. However, there are exceptions. The first two examples above, concerning dissertations about history and plant science, are examples of using African languages for complex subjects other than the languages themselves, and their use or teaching, The scholars involved found an advantage to writing in their first language and in so doing innovated in those languages - Xhosa and Gikuyu - as well as in their respective academic fields. These examples stand out, but as the dissertation title in Amharic mentioned above indicates, they are not unique. So, as we develop a list of dissertations in African languages, particular attention should be paid to the range of disciplines concerned. Also important to track are university and departmental policies on use of African languages in writing theses - changing to permit this, such as at Rhodes University, or actually encouraging such writing, such as at Obafemi Awolowo University. 1. I have not included Arabic in this analysis, since it is a widely used international language. 2. Thanks to Lawrence Adewole, Solomon Atnafu, John Philips, Charles Riley, and Valentin Vydrine for their willingness to share information they have. I take full responsibility for any innacuracies in this post, however. 4. E.S. Muogilim. 1982. "Nigerian Education: A Classified Bibliography of Doctoral Dissertations , 1946-1976." A Current Bibliography on African Affairs Vol. 14, Issue 3. 5. H.J.M Mwansanko. 2003. "Swahili in Academic Writing." Nordic Journal of African Studies 12(3): 265–276. A couple of years ago, I wrote a couple of posts about a map of second languages in Africa, within a set of similar maps for all continents, that came out of Olivet Nazarene University (ONU). Well there's another version by Max Holloway on MoveHub that actually dates to 2014, which is making the rounds again now thanks to Digg. I actually think that it's great that people try to produce such different ways of looking at facts we sometimes take for granted. Not meaning "alternative facts" here, but maybe alternative ways of looking at facts - different angles which help understand a complex whole. And I especially appreciate the effort that has gone into doing this with regard to languages. Also, it is worth noting that the map of Africa above covers more countries than the ONU map - no small effort in either case, but kudos to Max Holloway and MoveHub for taking it further. All that said, the first issue with this effort is the same as with the other one: Is it "second most common first language" (L1) or "most common second language" (L2)? I think it's intended to be the first, but that's muddied by mention "second language." Or is it really something like the second most commonly spoken language (L1+L2)? It would help to begin such efforts by mentioning these alternatives, and making it clear what one is and and which ones aren't being referred to. What counts as first most spoken? Second, there are questions about assumptions made and data used. Is the assumption here - like in the ONU map - that the "official language" (a legal or sometimes constitutional category) is the most spoken (first) language? That cannot be assumed to be the case, especially in African countries where official languages generally are those inherited from the colonial period. So for example, as I discussed previously (in "part 1"), Bambara would not be the second most spoken language in Mali, but rather the first (L1+L2, and probably L1 only), with the official French probably being second (counting L1+L2 speakers, but definitely not first or second counting L1 only). Similar issues arise in many countries. I won't go into all of them (having done so previously, in "part 2"), but will note the interesting case of Ethiopia. The two most spoken languages there are Amharic and Oromo, and figures vary on their respective numbers of speakers. The ONU map showed Oromo as the second language, but in the accompanying article cited figures that Oromo was spoken by more of the population. The map above from MoveHub reflects the latter (Amharic as second). The figures in Ethnologue are very close, with about 100k more Amharic speakers (L1+L2) than speakers of all varieties of Oromo (which are generally taken together, thought that couold be another discussion), However it looks like a larger percentage of Oromo speakers are L1 speakers, there being a significant number of L2 speakers of Amharic. I go into all this as an indication of the kinds of complexities one gets into when trying to make a simple declaration of which language is the second in the country - as well as the need mentioned above to be very clear what criteria one is using. But what about the data on which the map is based - where did the information used come from? Perhaps from a list something like this one from InfoPlease? Many of the labels on this map look like the languages listed in second position for various countries, including "Sudanic" for Burkina Faso and "Bantu" for Angola, which are language families and not languages (and Sudanic is not currently used as a linguistic classification). So a major issue is the quality of data relied on, and its interpretation on the map. On the topic of language groupings, Fon in Benin is a Gbe language, like Ewe in Togo and southeast Ghana. In all three of these countries (among many, as noted above) the rankings of languages should be reviewed - although it is interesting to imagine the unexplored implications of three states in West Africa having major numbers of Gbe language speakers. Again, I won't review this in detail, as much is similar to the ONU map already reviewed, though with some differences that are interesting (such as Mende probably correctly the second most spoken language in Sierra Leone after Krio) or puzzling (such as Kiunguja, a dialect of Swahili in Zanzibar, for Tanzania). Where to go with all this, and why spend three blog posts on it? On the latter question, I think that this map concept is a useful way to look at languages in Africa - and the world (remembering that both the ONU and MoveHub efforts covered all continents). However, nice graphics have a way of circulating and if the information in them is not accurate, or otherwise presents a confusing picture, they don't serve the purpose they were created for. Yet in the case of Africa, at least, this is a complicated subject based on often imperfect data that can be interpreted variously. So anyone's map of a clearly defined "second (most spoken) (first) (first & second) languages" by country could be critiqued on details. the third most spoken (inspired on the latter by an interesting map of third most-spoken languages by state in the US). Put these three side-by-side with the standard map showing official language(s) by country and you have the basis for some interesting discussions. * "Second most spoken languages in Africa" (1 May 2015) discusses the problems with the ONU map, while "Second most spoken languages in Africa, part 2" (8 May 2015) comments country by country. See also, "How many people speak what in Africa?" (7 May 2015). A quick return to (English) terminology about languages in Africa. 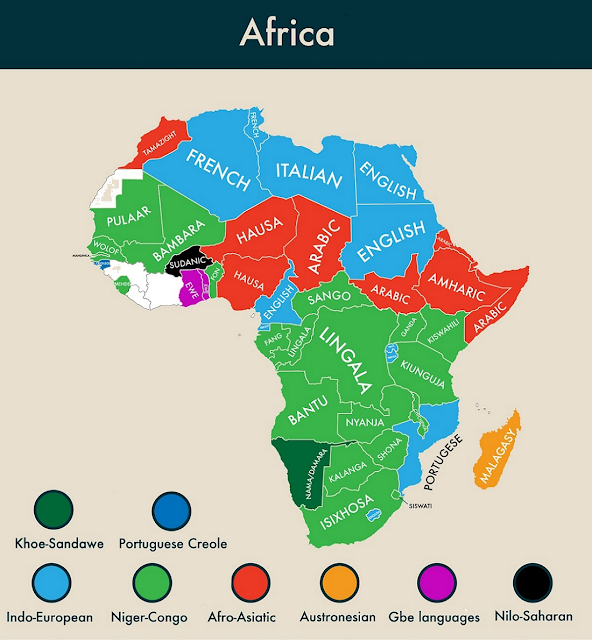 Earlier posts have considered why it is that a multilingual African is "bilingual" only if they speak two Europhone languages,1 and the mixed messages in using the term "local language" for any African language.2 Here I'll look briefly at two terms few have heard of and fewer ever use - epilanguage and sesquilingual. - and how they might fill out English vocabulary for understanding multilingualism in Africa. Africa has hundreds or thousands of languages - the exact number depends on how you count them, since many fall in groups of more or less interintelligible languages - and many Africans are polyglots, or at least speak a little of several languages. But African multilingualism is complex beyond numbers - who speaks what, when, and where; what is changing in terms of which languages are used and how they are used; and of course the technological dimensions. Could these terms be used to help enrich linguistic analyses and language planning in Africa (and elsewhere)? a deeper linguistic structure involved for instance in how we learn. When I first encountered this term in the first sense some years ago (in a CFP), one of my thoughts was that it seemed to describe the position of Europhone official languages in Africa. It's only recently, however, that I have come back to it to do some small research on its usage and meanings. My thought is still that in considering the rather unique roles of Europhone languages in Africa, a term like epilanguage is relevant, reflecting what can be described as their "overlay" on the African linguistic terrain. It also would facilitate discussing them in terms of function (in administration, or in academic and literary production, for instance) without reference to their origin or the roles assigned to them by language policies. To be sesquilingual means to speak or understand a second language only partially (the prefix "sesqui-" meaining one and a half). This phenomenon is common anywhere, but not something described often with this term, which is rarely used despite apparently being quite old. Sesquilingualism can be on the individual or collective level. It may be the result of contact or formal learning, or be inherent to languages being closely related. There are also of course situations common in Africa where school leavers have only a partial command of the school language (generally Europhone, and unrelated to African first languages), and conversely cases where students may get more of the Europhone language in school and at home but little or no depth in their mother tongue (observed among some urban elites). The ability to understand a language without being able to speak it has also been described as "passive bilingualism" or "receptive bilingualism" (among other labels; see the long thread following a question I posed on the Code-Switching Forum in 2007). This however would be only one part of the range of situations covered by "sesquilingualism." Within the broadly acknowledged multilingual nature of most African societies, there would seem therefore to be various possible sesquilingualisms, collectively representing a factor that might be important for understanding the quality of communication and learning in various contexts. Have we been missing something, or is this not a significant issue? The two concepts - epilanguage and sesquilingualism - can be used together, of course, per the example given above of school leavers. The two terms have clear cognates in French, Portuguese, and other European languages. Another question for another time would be how to speak of these two concepts, as well as other linguistic terms, in African languages. 3. Although I understand from Coleman Donaldson that "epilinguistic" (or its French cognate) in French anthropological linguistics is the equivalent to "metalinguistic" in Anglophone academia. 4. J.F. Ossinger, 1768. Bibliotheca Augustiniana, historica, critica, et chronologica, Universitatis Bibliopolæ. p. 179. 5. R. David Zorc, 1986, "Some Historical Linguistic Contributions to Sociolinguistics," in P. Geraghty, et al, eds., FOCAL I: Papers from the Fourth International Conference on Austronesian Linguistics, 341-355. Pacific Linguistics, C-93.